Golden Canyon preserves geologic stories steeped in change. Like pages in a book, its rocks tell tales of ancient times when a lake once covered this land; they also speak of violent flash floods racing down the canyon. Golden Canyon is a fascinating showcase of the effects of water in an arid land. This tour begins at the mouth of Golden Canyon and describes geologic features and processes along the way to Red Cathedral. The colorful Golden Canyon contains an easy hike through its steep walls. 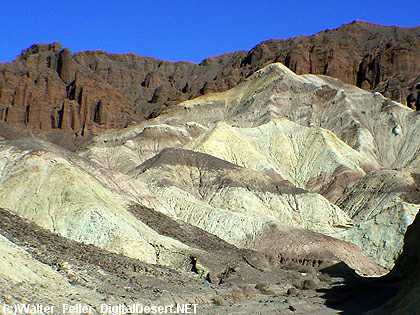 The trail can be followed up to the Red Cathedral formation, all the way to Zabriski Point or loop back to the Golden Canyon trailhead via Gower Gulch. This tour follows the trail to the top of the canyon beneath Manly Beacon. Length : 1 mile, one-way. Description : Easy trail through colorful canyon. Red Cathedral located .25 mile up from last numbered marker. Start : Golden Canyon parking area, 2 miles south of Hwy 190 on Badwater Rd.